I am a track cyclist with national ambitions. My home track is Alpenrose Velodrome. I focus mainly on 1k, 3k, and 4k time trials. I am the 2009 and 2008 35-39 Masters National champion in the 1000m time trial, and the 2008 35-39 national silver medalist in the 3000m pursuit. 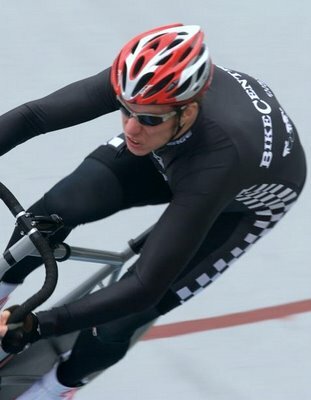 At the Alpenrose Velodrome Challenge 2009, I beat out Canadian multiple elite national champion Travis Smith to set a new local track record for the 1000m time trial, eclipsing the previous record set by multiple Olympic Gold Medalist Marty Nothstein in 2001 by more than .3 seconds. At the state level, I also have the fastest 3000m time by anyone at Alpenrose since 1995. Together with Zac Kovalcik and Daryl Hemenway I placed third in the FICA national six day championship 2008 (Zac crashed on day 2). I placed second with Steven Beardsley in the FICA national six day championship in 2006. I get my coaching from Brian Abers, and train with the BRIHOP crew.